Let the reasonable discourse continue. "I am a certified iFixit pro." JiB is definitely gonna move in this weeks JOM Power Rankings. I hate replacing screens on anything. Apple or not. Baseball does not have a designated hitter. Finally figured out what’s been bugging me about the ‘one beer’ thing. That’s the sort of thing someone over the limit would tell the cop when they get pulled over. They can’t say none since the reek of alcohol, but don’t want to say ‘a few’ since that implies too many. She says she was at a party, so of course she drank something. But she sticks with one to make it sound like she was under control. Idk - comes across as a tell to me. George Will must be so sad today. Danoso, might be true. As the song goes, "one scotch, one bourbon, and one beer." Yuuuge thanks to TM even though I had no trouble going past page 20. Did we make a new JOM record? Am a survivor? In that case, please confine yourself to the previous thread. Yes, you’re a survivor, Frau. Everyone is! Yay! Who is the top HR hitter in baseball? Is he a Yankee? Be careful TM, this is not a foregone conclusion. But who can think baseball, when we are getting ready for hockey. Fittingly, the Bruins, my first team to root for when a kid in Newfoundland, play the Caps. Go get'em guys. You saw her authorized yearbook picture, still. Found in scribn o think, it was probably just on keg (maybe a good name for a blog) for her. Yay! And I want to say how much I am missing Miss Marple links - I hope your connection gets better soon! And another one at 18:13! JamesD is in euphoria at the game. The way to start a defense of your trophy. Finally figured out what’s been bugging me about the ‘one beer’ thing. Flake and Collins whined, but Trump was on that last night. He's kicking their asses with his endurance and work ethic. Remember that 1990 interview when he lamented about his friend's need to get 8 hours of sleep a night, and how said it was that his other friend would be worried about a home mortgage while Trump was in the process of setting up an air shuttle between NY and DC, buying some sort or sports team (or league), and one other fairly major thing, yet sleeping like a baby for 4 hours per night? Which one, swetnick had clearances for state justice and homeland, doesn't that make you feel all warm and fuzzy. Please go to my post at the very end of the last thread. I am currently unable to copy links or tweets from Twitter. I am locked out. I will be calling my GOP senator in the morning. She remembers drinking only 1 beer as firmly and precisely as Corey Booker remembers groping that gals breast in 1984 with "Highway To The Danger Zone" ringing in his head. Okay. at 18:13 it means they scored again at 1.87 minutes. They clock down in hockey, not up. It is pretty crazy here at the Capital One Arena (ugh, I hate that name). Can’t ask for a better start to the title defense. On my last post at the end of the last thread, I thanked you for your kind offer and will take you up on it if my son's friend cannot help. Fox has learned that Jackson Cosko arrested in connection with doxing senators was an unpaid intern with Rep. Sheila Jackson Lee (D-TX). Fox is told that Cosko has only been with Jackson Lee’s office a couple of months but has now been terminated. Wasn’t Lee at some of the Kavanaugh hearing on last day? Swetnick that whack job with a security clearance scares the heck out of me. I want James D to be happy at the game. However down the line I want the Cleveland Indians to win it all this year. It is our turn after so many years in the wilderness and coming so close to winning it all. The Hill is filled with Cosko kids. The Reps and Senators do nothing to control them. Its been going on for years, and years. They get the "power" bit and think they are invulnerable. About time capital police stomp on them. When I was there, they would brag about how distracted their senator or rep was and how they could just say or do anything. Not anymore. Harry Crews is, I agree, a great writer--just brutal but funny on his dirt-poor Georgia childhood. I too am a survivor! Gosh, that thread did take the cake. MM, come back to us! DOJ National Security Division has a press conference scheduled for 9:30 tomorrow morning. Yes, it does. So does the "I remember the laughing, it was indelibly seared into my memory". Let me explain. The survivor of the Last Thread and many a blackout, too many to remember, the last thing to go was always the hearing. Of those times I do remember, the only thing I can remember in detail was the sounds, usually of people laughing at me and maybe some hazy, distorted images. I think the laughter seared into the memory part means she drank too much and passed/blacked out. 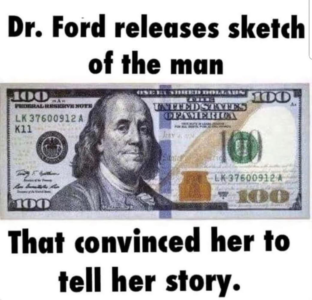 That is if she didn't dream the whole thing up and lied through her teeth. "This is a desperate effort to bluff the press into thinking there is something sensational behind the curtain. There's no there there, but they know that confidentiality rules prevent us from dispelling the notion fully." Enjoy! Drink in the moment. Was that a poetic phrase or a command, one cannot be sure. The "pinballing" down the stairs also strikes me as a tell. That's something you see, not something that you can distinguish from sounds you hear while you're hiding in the bathroom with the door locked. But whatever, it's all lies. Anything info sent by Durbin is suspect. BREAKING: Former top FBI lawyer James Baker gave "explosive" closed-door testimony on Wednesday detailing for congressional investigators how the Russia probe was handled in an "abnormal fashion" reflecting "political bias"
The information in the background investigation file is not marked top secret or classified, but it is not to be leaked to even characterized. Senators are "not allowed to share any details whatsoever," a committee aide said. That rule will likely be tested. You mean the (D)'s are not above leaking information? Who knew!?! Reading the linked Baker story, it appears an unknown source for FISA was revealed. An "explosive" source per Rep Jordan. Rosenstein gets questioned next week. Simon schuster is the latest to be handed the fusion file. Anything sent by Durbin is a lie. By definition. I remember when Chuck Schumers aides illegally accessed RNC Charman Michael Steele's SSN number and were caught using it to snoop for dirt or him, and Schumer explained it was just some overzealous Junior folks being kids and no harm, no foul, and blah, blah, blah. Odd how these junior aides keep doing this stuff all on their own, under the very noses of their Congressional employers who naturally know nothing about it at all. You guys should go to Imperator Rex's time line. Look for the thread which starts "OK buckle up." Big stuff including a DOJ press conference. Such interesting times we live in! I think Page flipped. I think Ohr accidentally testified truthfully. It's been a while, but wasn't the consensus that Baker was an honest broker? Why is Durbin still in DC or even alive? Who is responsible for his continued existence? He called US military in Iraq "Nazis." To quote my West TX mother, Durbin is not worth the powder and lead it would take to blow him to Kingdom Come. "The Hill is filled with Cosko kids"
Yet, I've read multiple times that Repubs routinely hire staffers that are Dems and have worked for Dem Congress people ("experience" getting more value than "trustworthy"). Beasts, I have no way to evaluate any of them. Not sure I label any of those three "honest." In a multi-player prisoners' dilemma, I evaluate those three as most likely to fault (break the thieves code of silence). As a contrast to Strzok or McCabe (or in my book Rosenstein or Sessions). Well he went to work for goldsmith lawfare, and was a,mutineers back in March 04, but maybe he saw the light. Durbin was also behind some of the targeting of conservative Tea Party groups by the IRS with Obama’s approval. Was Page attached to Baker? I agree - I think she told them the truth. I hope what is about to be announced isn't along the lines of the "Hillary was guilty but didn't mean it" version Comey provided. I have no idea what will be announced but hope fervently that at last the corruption is going to be revealed. "6 officers injured, 1 killed by shooter in Florence, SC; suspect in custody" - Deputies were serving warrant to elderly man. Serving warrants seems to be very risky. JamesD is getting his money's worth tonight. This was before we knew he was the contact man to the courier who led to ubl. Henry--it was a subpoena to produce the relevant FISA materials the FBI has refused to release. How can this be? I really feel sorry for the Bruins goalie. Not his fault. He needs some support on the check line. Haha! That is a great graphic!! I am cautiously optimistic but dont want to get my hopes up. I'm developing a new conspiracy theory around Project Veritas featured jerk offs slow walking the NCIS system for Red States. Is it even possible? I never had an issue before from GHWB to BO. Just passed a Homeland Security background check no problem. Just renewed my CDL and Hazmat with five freaking forms of ID and domicile. Out of curiosity what other states are moving to eight year renewals for DL and gun permits? He was in Utah with Huber today... supposedly. It could even get uglier for you guys. The Caps came to play and the Bruins not. Strzok is the one I think they'll try to use as the fall guy, henry. Of course, he can't blow his nose without permission from above. Rosenstein is boxed-in like no one in history. And he's not stupid; he knows he can't escape. Whether he flips or not I can't assess - he's that arrogant. It has been reported that Sessions was in Utah meeting with Huber today. Follow on with that? The Bruins are still in preseason. Oog. JiB, they gave the stat before the game that Ruuk (the Boston goalie) had one won in 15 starts vs the Capitals, so clearly they have his number. 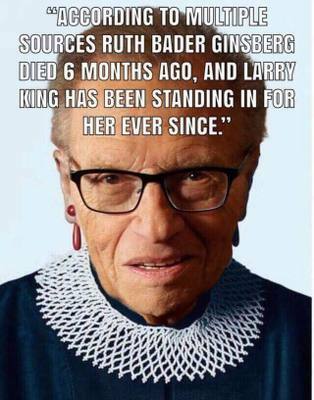 I'm getting a Planned Parenthood ad on the sidebar which features RBG. The photo gives life to this old rumor. Truly, there is a resemblance! My ugh wasn't a response to you, MM. I have NBCSports and TBS going in separate tabs. "Also note, Sessions was subpoenaed by the House today." He was subpoenaed to produce documents, though not to testify. I'm on a different computer right now, so I'm sorry I don't have a link to the info, but the documents demanded include a bunch of FISA stuff, IIRC. WI real ID DL is 8 yrs; CCW is 5. We will find out for sure tomorrow . And of particular interest, Goodlatte (sp?) demanded unredacted docs. Thanks Clarice and JMH, busy today. Missed that detail. Sessions in Utah with Huber: Utah US Attorney's office caught the ricin mailer. But it could be a multi item agenda. Your post on 25 Page megathread was really funny! I somehow skipped over a bunch of posts and didn't realize clarice had already mentioned the subpoena. Frau came up with the survivor idea.